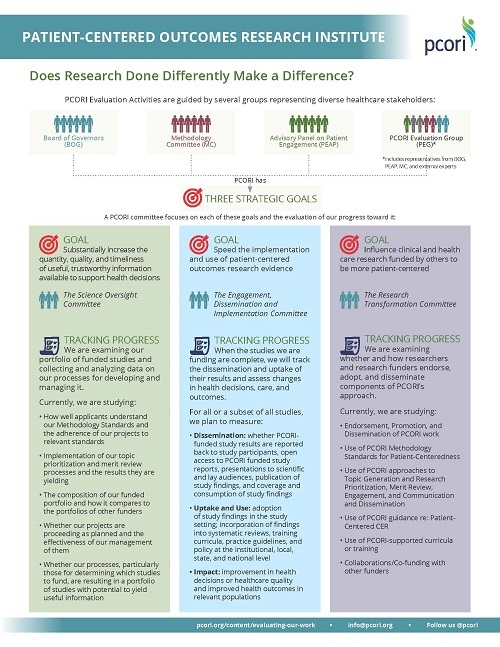 PCORI takes a unique approach to funding comparative clinical effectiveness research—ensuring that we focus on options and outcomes important to patients, and that patients and others across the healthcare community have a meaningful role in guiding our work. Michele J. Orza, ScD, Chief of Staff, explains how PCORI evaluates its work. Patients and other stakeholders help us determine which research topics we should consider for funding, and they help us review proposals. We also require that patients be included as meaningful partners in the research we support, helping to develop and conduct the studies and disseminate the results. We’re committed to this approach, which we call “research done differently,” to focus the research we fund on producing useful information to answer the questions of greatest importance to patients and those who care for them. But is our approach succeeding? What Brings the Best Results? As proponents of evidence-based practice, we’re eager to learn what works best to produce useful information that leads to improved health outcomes. Our Board of Governors oversees our evaluation plans and activities, and our Methodology Committee guides the designs and methods. Each of three strategy committees, comprised of Board and Methodology Committee members, focuses on the activities aligned with a specific goal in our strategic plan. PCORI is committed to functioning as a “learning organization,” so staff from all departments participate in monitoring our progress toward our goals and in learning how we can improve our work. The Office of the Executive Director coordinates PCORI’s extensive evaluation activities. It works in close partnership with our Evaluation and Analysis program, which implements most of the evaluation activities, and our Engagement program, which ensures the meaningful engagement of patient and other healthcare communities in our evaluation process. We welcome your feedback on our evaluation work. Email [email protected] with inquiries or comments about our activities and progress. The PCORI Evaluation Group, a consultative task force that included Board and Methodology Committee members, as well as external experts, assisted PCORI in developing its evaluation process. Read more about the group.